Freedom Trail Run has been added to your itinerary. 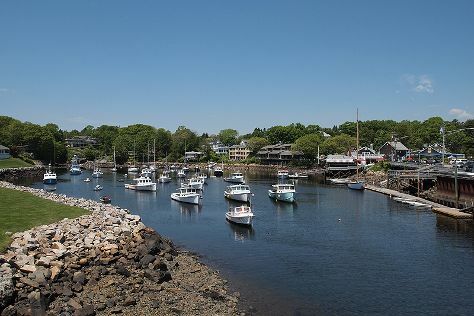 Visit Marginal Way Walkway and North Bridge for their historical value. There's still lots to do: appreciate the extensive heritage of Freedom Trail and steep yourself in history at Longfellow House Washington's Headquarters National Historic Site. For photos, other places to visit, ratings, and other tourist information, go to the Boston route planner . Fresno to Boston is an approximately 10.5-hour flight. You can also do a combination of train and flight; or drive. Traveling from Fresno to Boston, you'll lose 3 hours due to the time zone difference. Traveling from Fresno in July, you will find days in Boston are a bit cooler (83°F), and nights are about the same (67°F). Wrap up your sightseeing by early afternoon on the 16th (Tue) to allow time for the car ride to Lancaster. Kick off your visit on the 17th (Wed): get engrossed in the history at Railroad Museum of Pennsylvania, then steep yourself in history at The Amish Farm and House, and then find something for the whole family at Dutch Wonderland. For maps, more things to do, reviews, and tourist information, you can read our Lancaster trip planner . Drive from Boston to Lancaster in 6.5 hours. Alternatively, you can do a combination of flight and train; or take a train. In July, daytime highs in Lancaster are 84°F, while nighttime lows are 66°F. Finish your sightseeing early on the 17th (Wed) so you can travel to Pittsburgh. To see photos, more things to do, ratings, and more tourist information, read our Pittsburgh trip planner . Traveling by flight from Lancaster to Pittsburgh takes 3.5 hours. Alternatively, you can drive; or do a combination of train and bus. In July in Pittsburgh, expect temperatures between 82°F during the day and 65°F at night. You'll set off for Johnstown on the 18th (Thu). Johnstown is a city in Cambria County, Pennsylvania, United States, west-southwest of Altoona and east of Pittsburgh. On the 18th (Thu), explore the striking landscape of Johnstown Flood National Memorial. For reviews, traveler tips, photos, and tourist information, you can read our Johnstown driving holiday planner . Traveling by car from Pittsburgh to Johnstown takes 1.5 hours. In July, daily temperatures in Johnstown can reach 78°F, while at night they dip to 61°F. Finish up your sightseeing early on the 19th (Fri) so you can travel to Harrisburg. Harrisburg is the capital city of the Commonwealth of Pennsylvania in the United States, and the county seat of Dauphin County. Kick off your visit on the 19th (Fri): get engrossed in the history at National Civil War Museum, pause for some serene contemplation at Cathedral of Saint Patrick, and then get a sense of history and politics at Commonwealth of Pennsylvania Capitol Complex. To find traveler tips, where to stay, maps, and tourist information, use the Harrisburg online driving holiday planner . Traveling by car from Johnstown to Harrisburg takes 2.5 hours. In July, Harrisburg is a bit warmer than Johnstown - with highs of 86°F and lows of 68°F. Cap off your sightseeing on the 19th (Fri) early enough to go by car to Hershey. To find maps, more things to do, and tourist information, use the Hershey trip itinerary maker app . Hershey is just a stone's throw from Harrisburg. In July, daily temperatures in Hershey can reach 86°F, while at night they dip to 69°F. Cap off your sightseeing on the 19th (Fri) early enough to go by car to Williamsburg. Start off your visit on the 20th (Sat): steep yourself in history at Jamestown Settlement, steep yourself in history at Historic Jamestowne, and then go on a hair-raising tour with a ghost and vampire tour. Get ready for a full day of sightseeing on the next day: steep yourself in history at Governor's Palace, then take in the architecture and atmosphere at Bruton Parish Episcopal Church, and then contemplate the long history of Colonial Williamsburg. To see ratings, reviews, maps, and other tourist information, refer to the Williamsburg online vacation planner . You can drive from Hershey to Williamsburg in 5 hours. Other options are to do a combination of taxi, flight, and train; or do a combination of bus and flight. In July in Williamsburg, expect temperatures between 91°F during the day and 73°F at night. Wrap up your sightseeing by early afternoon on the 22nd (Mon) to allow time for travel to Valley Forge. Valley Forge National Historical Park has been added to your itinerary. Here are some ideas for day two: identify plant and animal life at Green Lane Nature Center, contemplate the long history of Pennypacker Mills, and then trek along Perkiomen Trail. For traveler tips, reviews, maps, and other tourist information, read Valley Forge travel route builder site . The Route module can help you plan travel from Williamsburg to Valley Forge. Prepare for slightly colder weather when traveling from Williamsburg in July: high temperatures in Valley Forge hover around 84°F and lows are around 66°F. On the 25th (Thu), wrap the sightseeing up by early afternoon so you can travel back home. On the 25th (Thu), stroll the grounds of Gettysburg National Cemetery and then witness the site of a historic battle at Gettysburg National Military Park. On the 26th (Fri), you'll have a packed day of sightseeing: take in the history at Antietam National Battlefield. To find more things to do, other places to visit, reviews, and other tourist information, read our Gettysburg road trip site . Traveling by car from Valley Forge to Gettysburg takes 2 hours. July in Gettysburg sees daily highs of 84°F and lows of 66°F at night. On the 28th (Sun), you're off tohome. Chapel Hill is a town in Durham and Orange Counties, and the home of the University of North Carolina at Chapel Hill and UNC Health Care. Start off your visit on the 28th (Sun): take in the architecture and atmosphere at The Chapel of the Cross. On the next day, steep yourself in history at Ayr Mount Historic Site, contemplate the long history of Old Town Cemetery, then identify plant and animal life at Conservators Center, and finally appreciate the extensive heritage of Coker Arboretum. To see more things to do, traveler tips, other places to visit, and more tourist information, go to the Chapel Hill trip planning tool . Traveling by car from Gettysburg to Chapel Hill takes 6.5 hours. Alternatively, you can take a bus; or do a combination of bus and train. In July, daily temperatures in Chapel Hill can reach 89°F, while at night they dip to 70°F. On the 31st (Wed), you'll have the morning to explore before heading back home.